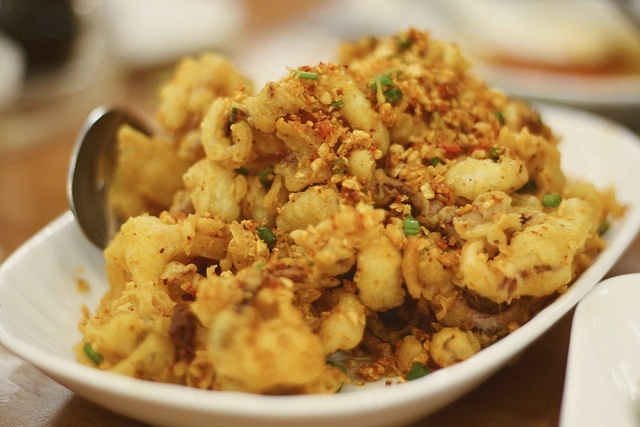 Squid fried with salt and pepper is a great tradition for all kinds of seafood. Ideal for snacks and finger food, the tender squid can be served on its own, with noodles or with rice. Prepare squid by pulling head apart from body. Sever tentacles and trim. Rinse inside body sac and pull put backbone, then clean it inside and out, removing any skin as well. Slice squid into rings, then pat them really dry. Place on a dish with tentacles. Mix salt and pepper with flour, tip it onto squid and toss well, making sure it is fairly evenly coated. Heat enough oil in a wok or a heavy-based saucepan for deep-frying. Cook squid in batches, until rings turn crisp and golden. Drain on kitchen towel and serve with lime to squeeze. Garnish with chopped coriander or spring onions.